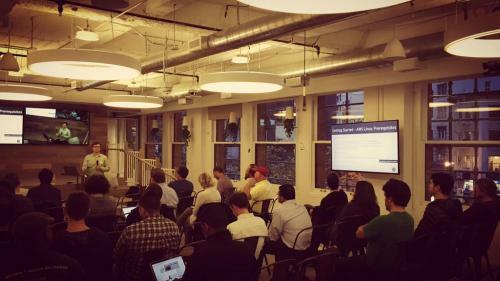 This week, we hosted the San Francisco AdvancedAWS Meetup at our San Francisco office. We had two awesome speakers talk about advanced AWS tools that I think many people running on Amazon will find useful. The first was a tool called CloudCoreo, created by the presenter Paul Allen, that aims to be a replacement for AWS CloudFormation. CloudCoreo gives you the ability to share and extend server configuration templates. I personally like that it solves many of the headaches with CloudFormation that I’ve had to deal with in the past— templates getting out of date or servers drifting from the original template. The second talk by Jon Skelton gave us a deep dive into Suricata, a tool for doing IDS on AWS. Jon walked the audience through some advanced use-cases for Suricata. We love hosting meetups at the Bigcommerce offices— if you know of any awesome software or technology meetups in SF, Syndey, or Austin, please get in touch with us! We will be hosting the GoSF meetup in June, so make sure to RSVP!